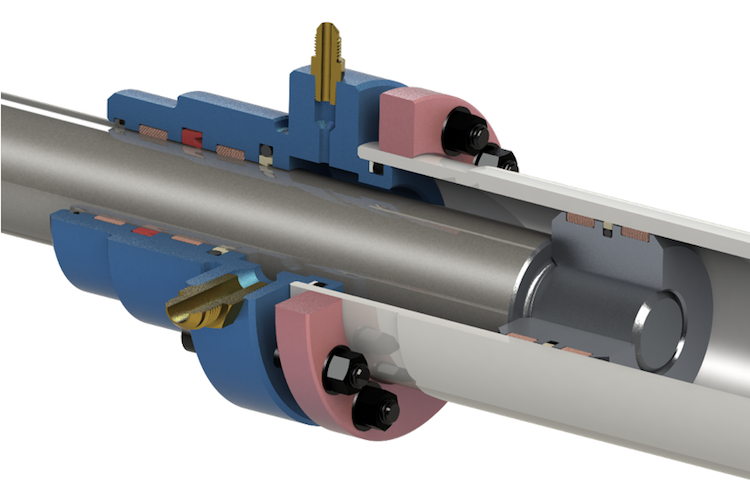 All moving shafts, whether they’re reciprocating or rotary, require some form of guidance to avoid metal-to-metal contact due to relative motion during use. There are many different styles of bearings available in the market place today. In some cases, a rotary ball and race are used to especially in rotary service due to side loading of the driven shaft. While linear ball bearings such as ball screws are used in CNC lathe equipment, there are two common and inexpensive methods for guidance for reciprocating and/or oscillating and slow rotary. These are to use either a bronze bushing to allow a shaft to rest on and carry side load, or a polymer bearing. Eclipse Engineering designs a variety of polymer bushings for reciprocating, oscillating and slow rotary service. Some very common applications where you’ll find this style of bushing are cylinders, both pneumatic and hydraulic. These bushings have the capability to handle extreme side loads, while keeping the shafts centered in their respective bores. 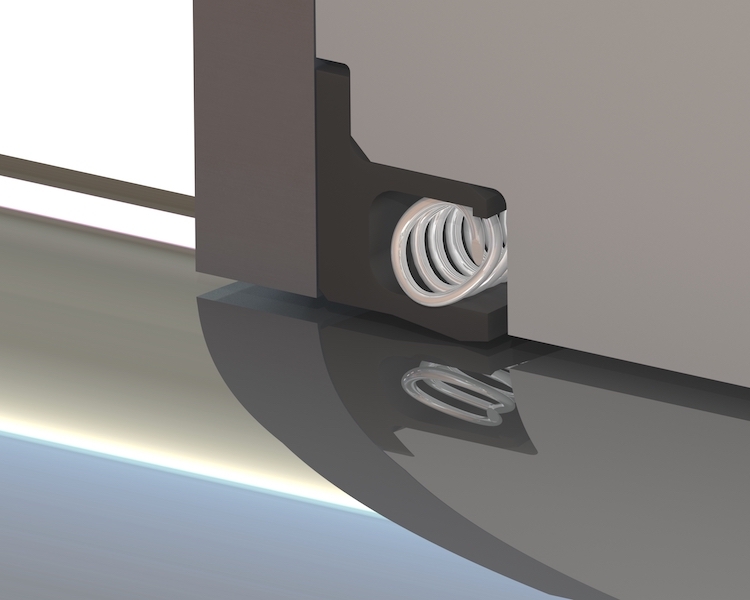 This allows seals to maintain fluid within the working cavity. Some of the more common bushing materials are filled PTFE or Teflon ®. Eclipse’s ET010: Bronze-filled PTFE is frequently used for bearings and wear rings across all industries. The filler is dependent on shaft material, media, and speed. In severe conditions, polyester filled resins are often used with different forms of polyester cloth or Kevlar to improve the load carrying capability. Eclipse’s EC131 material is an example of this. Keeping the shaft centered with little or no eccentricity is paramount to allow the seal the best opportunity to retain fluid in the system. Many of these bushings or wear rings are self-lubricating, but in cases where a non-lubricating polymer is used, the design may incorporate a groove in the bushing to retain some type of added lubrication to the system. As in all engineered bushings, there’s some basic assumptions necessary to calculate the load-bearing ability of the bushing. But first, we’ll provide a little background about the material used. With seals, we often consider the filler material to aid in reducing the wear of the bushing. Calculation of the load-carrying ability of the polymer is generally calculated by looking at the yield of the material under a compressive load and then applying some Factor of Safety to this number. One of the advantages of using polymers for bushing type materials is that they don’t point load like a bronze bushing, so much of the load is distributed over a broad area as compared to metallic bushings. 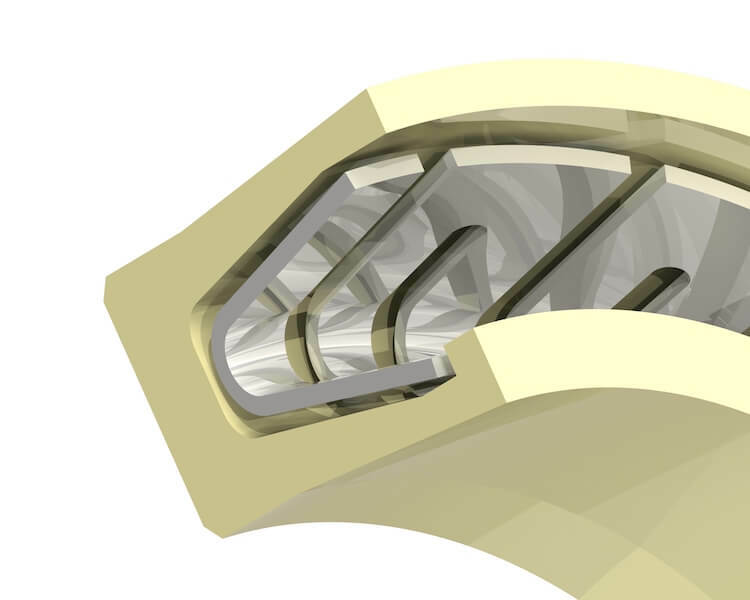 A good “rule of thumb” is to consider the supported area to be about 40% of the total area when designing a bushing for your application. We can do this because polymer bushings will deform as the load is increased allowing more area to carry the load. Materials such as filled Teflon® have a compressive strength of 1000 PSI, where a polyester resin-based bushing with filler can have as high as 50,000 PSI. There are many other materials that can be used as bushings, such as glass filled Nylon, or Teflon-filled Acetal. Each provides different characteristics for carrying load. Cost always enters into the discussion with glass filled Nylon, which may be injected molded, and is often a low-cost solution for higher volume applications with load carrying capability of about 36,000 pounds compressive. While Nylon has tremendous load-carrying capability, under heavy loads it can be very noisy. Nylon can even cause hydraulic cylinders to jump due to the friction between the interface of the bushing and the shaft. We often have to review the applications to determine the suitability of some materials. Some examples of when these considerations come into play is pumping oxygen where certain fillers or some lubricants are not compatible. FDA compliance may also be a factor. Another good example are trunnion pins for bridges. Sitting in sea water, they need to carry very heavy loads while surviving in their environment. Hydraulic cylinders appear to be a very easy application with plenty of surface area to work with. But unknown factors such as side load, or the need for the bushing to provide extremely smooth operation under heavy load will drive the material and shape of the bushing being applied. Slow-turning rotary unions generally don’t need a great deal of support, with little or no side loading. 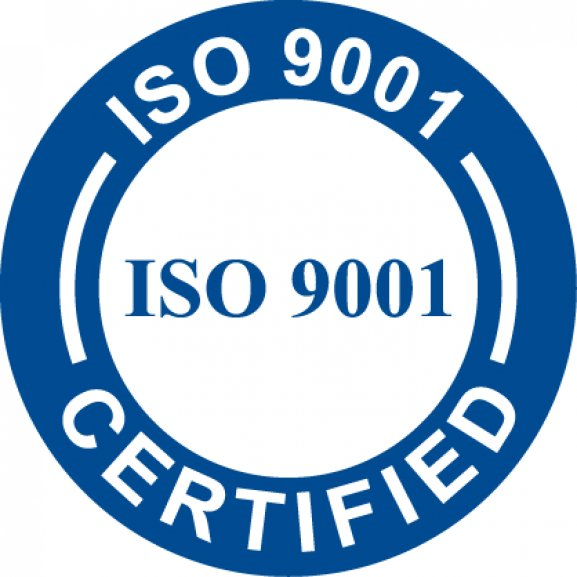 But due to the number of seals that may be present in some rotary unions, keeping the joint centered is critical to keeping seals preforming and providing long life for the smooth operation of the union. There are many industrial bearings that are injection-molded to size, but often times theses bearings are machined from tubes cut from standard cross section strips of material. 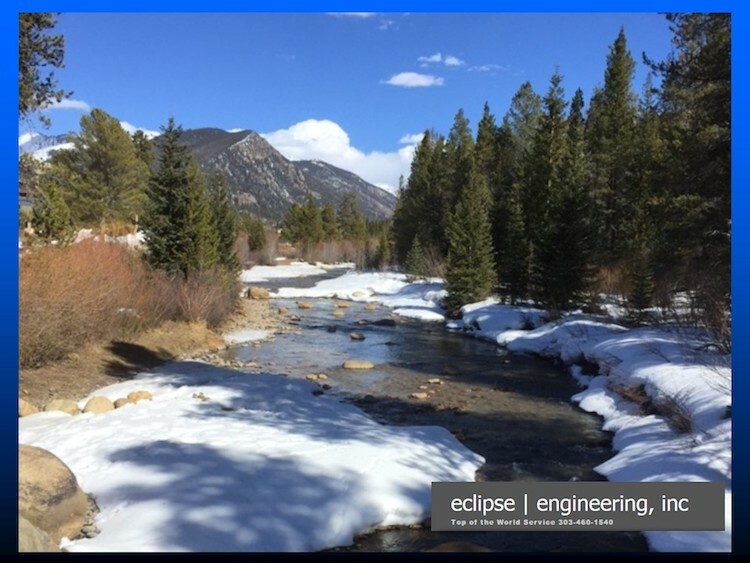 Eclipse Engineering designs and manufactures bearings to fit your specific application. We have a history of designing in many industries, from under the water to off the planet. This experience gives us a good understanding of the loads that you may encounter in your specific application.